This delicious dish only uses four ingredients and can be a side, appetizer, or a main meal! 2. Poke holes in your sweet potato, wrap in a paper towel or napkin, and microwave for 7-8 minutes or until very soft. If you aren't down with microwaves, stick it in the oven for 45ish minutes or until soft. 3. While your sweet potato is heating, cook up your sausage and set aside. 4. When the potato is done, slice some big cuts in it to release some of the steam and set aside. 5. Next up, lets cut the jalapenos. Cut off the tops where the stems are, then slice long ways so you have two little jalapeno boats. 6. Scrape/cut out the seeds and inner membrane thing. 7. 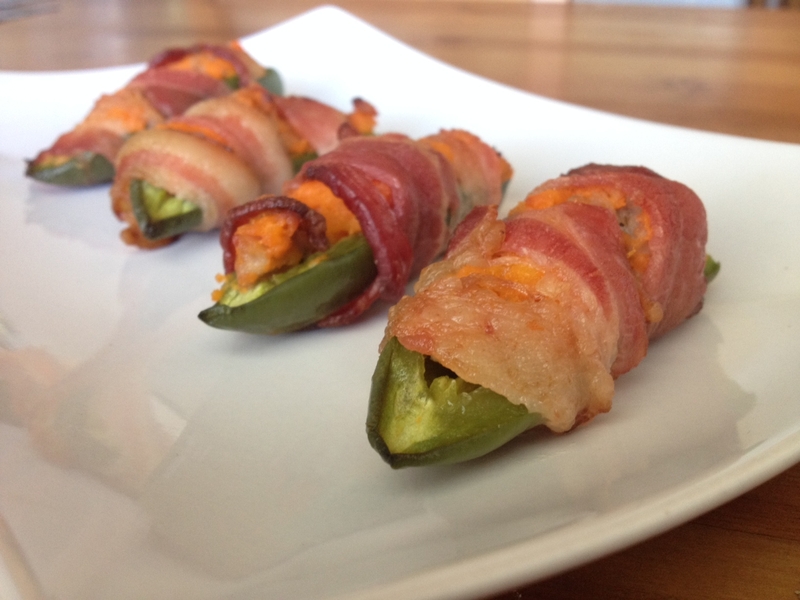 When you're done gutting the jalapenos, get out your bacon. Slice the bacon in half longways (so now you have long, skinny strips of bacon). 8. Peel your sweet potato, discard (or eat) the skin, and mash the insides of the potato with the cooked sausage crumbles. 9. Time to assemble! Spoon the sweet potato/sausage mixture into the jalapenos until they are full, then wrap one of the pieces of bacon around the outside. 10. Line them up on a greased cookie sheet. 11. Cook for 25-30 minutes or until the bacon is done.